Hospice of Michigan - NPO Showcase from GRTV on Vimeo. NPO Showcase highlights nonprofit and government organizations and the work that they're doing in our community. The program is a feature of GRTV, a service of the Community Media Center, with producer and host Adrian Hirsch. You can catch it on GRTV on Saturdays at 8 AM and 6 PM and can view past episodes at the Grand Rapids Community Media Center. 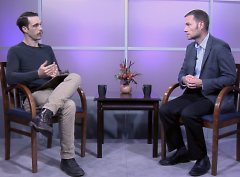 If your nonprofit would like to be interviewed on NPO Showcase, please contact Adrian Hirsch. In this week’s segment of GRTV’s NPO Showcase, Trevor Finton, Operations Manager from Hospice of Michigan explains the philosphy behind hospice care, and the services provided by Hospice of Michigan. Hospice of Michigan's goal is to provide excellent care for any patients eligible for hospice programs, such as those with a terminal prognosis of six months or less. Hospice programs provide in-home care for patients to assist in a more comfortable end-of-life experience. A core mission for Hospice of Michigan is to not turn any patient away, regardless of age, diagnosis or their ability to pay for services. Hospice of Michigan also provides resources and grief support to patient's loved ones so they can be better equipped during this period of life. NPO Showcase is just one of the many ways that the Community Media Center serves the nonprofit community. For information about this and other CMC services for nonprofits, or to schedule a future interview, contact Nonprofit Outreach Coordinator, Adrian Hirsch, at 616-459-4788 x105 or email Adrian Hirsch.